DTNA was the first truck OEM to offer remote diagnostic services when we introduced Detroit™ Connect Virtual Technician℠ more than seven years ago. This product unleashed extensive, data-backed insights, giving our customers an unprecedented look into vital stats about their trucks. With the innovative and groundbreaking Detroit Connect suite of connected vehicle services, we have continued to develop and deliver solutions that help our customers improve their uptime, productivity and profitability. These services provide superior customer experience and are a key differentiator for our trucks. Detroit Connect Remote Updates, available exclusively in the Freightliner new Cascadia, is an example of such innovation in action. Remote Updates enable our customers to make secure, over-the-air parameter changes to the truck’s engine, via a self-service portal. This is great for owner-operators and fleets alike, as it reduces downtime by eliminating the need for a visit to a service bay. Calculating cross-fleet fuel efficiency can be costly and time-consuming, but our fuel and safety analytics service, Detroit Connect Analytics, provides a single destination on the portal to access fuel consumption and safety data. These interactive, simplified reports offer actionable insights to improve truck and driver performance, and uptime. We are expanding our connectivity services with the announcement of our new Detroit Connect Direct platform. 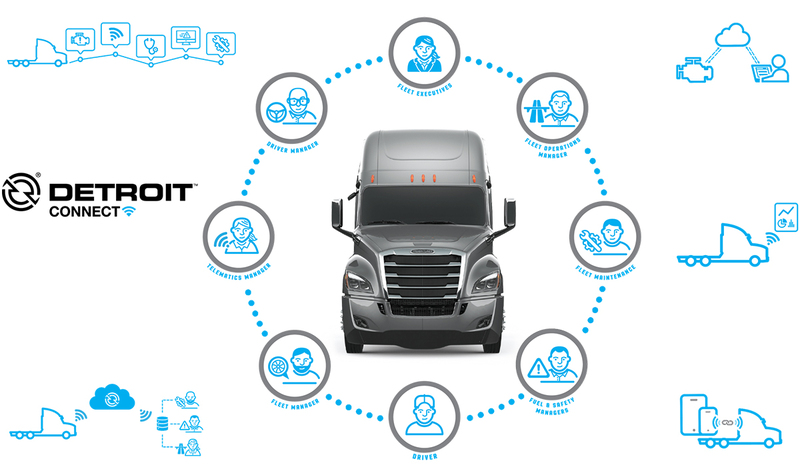 With Detroit Connect Direct, fleets gain immediate access to critical information like vehicle location, fault codes and diagnostics, fuel performance, safety data and driver behavior. Customers select which data they prefer, how much they want to see and how often they’d prefer access. They also decide the frequency of data to import into their back-end systems. Detroit Connect Direct is all about empowering our customers by providing on-demand information they can customize to meet their specifications and allow them to run their business more efficiently and profitably. The Detroit Connect Platform will also link wirelessly with an in-cab device, such as a tablet or mobile phone, via Bluetooth. This allows hours of service (HOS) data to be delivered to Detroit Connect-authorized Electronic Logging Device (ELD) apps, providing the necessary information required from the truck to meet federal ELD regulations without the need for any additional hardware. Our vision is to continue to build the Detroit Connect platform with new services and applications that have a positive impact on our customers’ businesses. Our connected trucks will be an integral part of our customer’s business and digital workflow. In short, our trucks will continue to extend our leadership position by being safe, connected, more fuel efficient and smart!